We are excited to welcome a brand new messaging API to our store: Parley. Parley lets you integrate a secure customer messaging channel into your businesses website or app. Check it out in our store! Messaging is becoming a favorite channel for customer communication among businesses and customers too. Messages are fast, dependable and don’t require customers to hang around for a reply. When a reply comes in, customers are conveniently led back to the app through push notifications. However, messaging as a business channel originally poses a challenge for data security. Many messaging channels were not created for businesses to use. Using these channels pose far reaching risks in the areas of information security, privacy and compliance. When you use Parley you don’t have to worry about these risks. As it is built into your own secure website or mobile app, you’ve already got it covered. Marco van de Kamp, co-founder of Parley, explains why messaging has one up on other customer communication channels such as web chat. “Messaging with Parley is a continuous conversation. It’s different to web chat because it doesn’t suddenly end the conversation when one part of the conversation is over”. What that means? For example, a customer starts an anonymous conversation on your company website. If your customer service agent needs to identify the customer, they can ask the customer to log in. But the conversation shouldn’t need to end there. 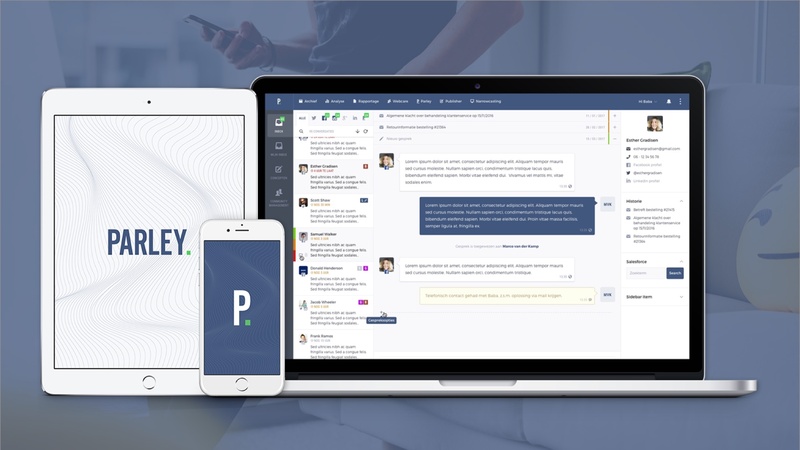 After the customer logs in, Parley links both parts of the chat and makes it into one continuous conversation. This way customers and agents can always access the full conversation history. In fact, with Parley, the conversation may continue across any device, whether it’s a web browser, mobile app or tablet. Just the sort of integrative approach that can make your customer experience even more satisfying and convenient. Integrating Parley into your own messaging channel means that you retain control. According to Marco, that control starts with where the conversation takes place. “You can implement Parley in your own apps, website or customer service solution. So, you can have Parley messaging happening within Salesforce or whichever other solution your agents use”. When you own the messaging channel, you also have full control of its security. “Encryption for anonymous chats is just a generic encryption. When it’s an authenticated user though, a developer using the Parley API can create a system encryption key for all messages specific for that customer. That means that we at Parley don’t have access to those conversations. Only you and the customer can decrypt them because we don’t store the keys”. A common use of Parley is to build secure messaging right into company apps. Take banking for example. “A customer logged into their bank account can use messaging to apply for a new debit card. Because the channel then needs to be both encrypted and authenticated already, it also becomes a secure channel for communication with the bank,” says Marco. “It’s more secure than phoning the bank’s contact centre,” Marco continues, “because there you’re just providing your date of birth and some other verbal authentication information”. So, what do you need to do as a developer to get started with Parley? Subscribe to Parley in our Marketplace. On mobile you can use the libraries for iOS and Android. For websites, you can directly use the API or one of the libraries available from Parley.